Two hundred years ago in Baltimore, America’s first gas streetlamp was lit for the first time. 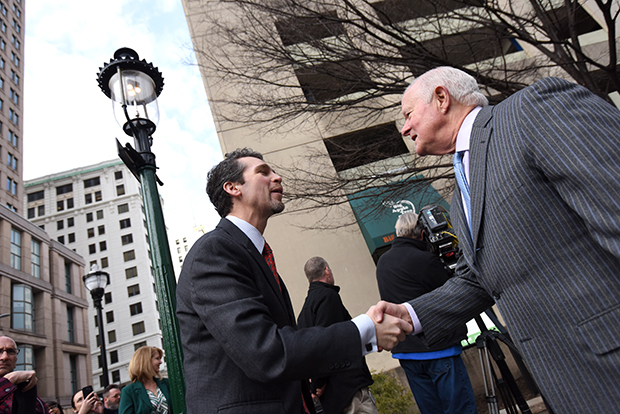 Baltimore Gas and Electric Co. on Tuesday celebrated the 200th anniversary of the lighting of the lamp at North Holliday and East Baltimore Streets in downtown Baltimore. The streetlamp was first lit Feb. 7, 1817 by the Gas Light Company of Baltimore, which preceded BGE. According to BGE, Peale first illumintaed a room in his museum on Holliday Street using a ring of burning gas on June 11, 1816. Eight days later, the mayor signed an ordinance allowing the Gas Light Company of Baltimore to begin lighting the streets. Editor’s Note: A photo caption on an earlier version of this story misspelled the name of Alexander Núñez. Tagged with: baltimore gas and electric Exelon Corp.
You could take the Camden Line to an Orioles game, but how will you get home?